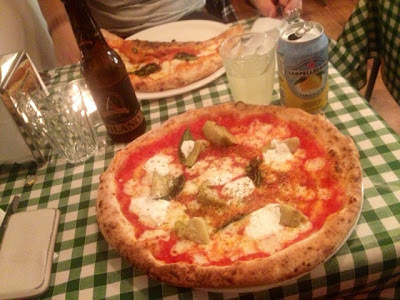 Last month Pizza Pilgrims opened up shop in a great spot on Dean St, a stone’s throw from Soho Square and directly opposite Pizza Express’ iconic Jazz Club. An interesting choice of location for a new pizza restaurant. It then occurred to me that just down the road you also have Soho Joe, a buzzing cafe also with a great pizza menu, and Forty Dean Street, an Italian restaurant a little further along. With so many pizzas on offer on one Soho street I decided to make it my mission to try out every one and compare. So commences my Dean St Pizza Showdown! The first destination on my quest was the restaurant that sparked the whole idea: Pizza Pilgrims. The Pizza Pilgrims van has occupied a spot on Berwick St Market for a little while now. It’s run by two brothers: Thom and James, and the boys have gone from strength to strength since their ‘pizza pilgrimage‘ through Italy and have since released a cook book, done a show for Food Network UK, and regularly appear at all the major food festivals around town. It was at Feast back in March that I first discovered them and I’d been excited to go try out their restaurant ever since they announced they’d be taking up residence in Dean St a few months ago. I went in bang on opening time at 6 o’clock and had absolutely no trouble getting seated in their dining area downstairs as we were the first to arrive. Staff were friendly and helpful and it didn’t take long for the restaurant to fill up around us. I really like the way they’ve decorated the downstairs dining room: simple and classic and full of checked green table clothes for a proper Italian feel. It’s bright and airy, despite being in the basement and has a great relaxed and casual feel. We were served promptly and I opted for the artichoke, ricotta and smoked garlic oil pizza. All pizzas are cooked fresh to order in a traditional Neapolitan style in the enormous burner at the back of the shop. Usually I’m put off by an enormous crust and often leave most of it, however the woody, earthy flavour taken on by the dough in the burner was delicious and I gobbled up the whole lot. This is pizza done properly and how it really should be. I loved the rustic homemade feel, I loved the toppings. I could find absolutely no fault with this pizza and I know without a doubt I’ll now be a regular customer at this new Pizza Pilgrims restaurant. Before I went I was a little unsure about the price point. Of course I understand that the overheads of a restaurant would bump up the price a little but having had pizzas from their van at £5-6 I was concerned that a new price point of £7-£11 might be a little overpriced for what you’re getting. I was wrong, it isn’t. The food, the atmosphere and the experience is entirely good value for money and at a final bill of £28 for a pizza, a calzone, a beer and a lemonade Pizza Pilgrims is still an inexpensive meal out. Unfortunately I think for me this rules it out as a working lunch stop which is a shame, but for a great value dinner I’ll be going here often. I was a huge fan of Pizza Pilgrims as a van and I’m even more hooked on the Pizzeria. The rest of the Dean St pizzas are going to have a tough job beating this one, I’ve begun on a seriously high note.